I can't wait to have a few moments peace to read through this book! Yes, you heard that right...this is not so much a review as a preview. It's the only book on my pile right now, but with all the busyness of the season, I just haven't been able to get to it. 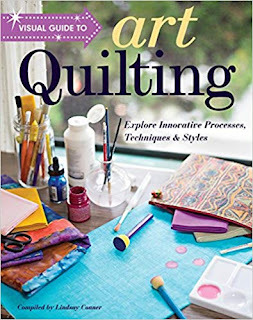 So here's what's in store for anyone who wants to take the chance on The Visual Guide to Art Quilting, compiled by Lindsay Conner! Chapter 1 covers design theory and inspiration. Where do you get your ideas? How do you work with a theme? Design ideas like grids, slice and rearrange, realism, and abstraction. Color. Working in a series. Chapter 2 is about materials and supplies, including how to create a design wall. Chapter 3 covers working with fabric, including organizing your fabric stash, different ways to applique, and improvisational patchwork. Chapter 4 includes many surface design techniques, like dyeing, adding texture, freehand painting, stamping and printing. Chapter 5 covers adding dimension to your pieces with more texture, embellishments, and creating stitching. Chapter 6 teaches quilting both by hand and by machine. Chapter 7 covers finishing techniques and presentation details, including how to bind, stretch, wrap, and hang your quilts. Change is good. But hard.